With 15 million customers, MailChimp is one of the biggest email marketing platforms around. If you use the system, you already know that they have a built-in reporting system; however, their system only gathers MailChimp data. With a DashThis MailChimp dashboard, you can gather all your email marketing data in the same place, and even add in other digital data to see the correlation between your email campaigns and web traffic. Create your Mailchimp dashboard today! This list widget shows your top MailChimp email campaigns in order of unique open rate. This list widget shows your top MailChimp mailing lists in order of member count. This historic widget shows the unique open rate of a specific campaign. As soon as a particular recipient opens an email, it is considered only one unique open (even if the recipient opens the email more than once). 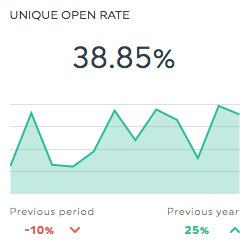 The unique open rate is calculated by dividing the total number of unique opens by the total number of emails sent, and multiplying the result by 100. 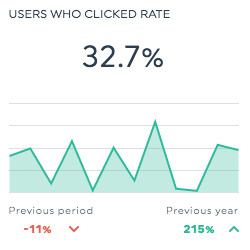 This historic widget shows the rate at which users clicked on a particular element in your email. It is calculated by dividing the total number of clicks by the total number of recipients, and multiplying the result by 100. Want to see all our MailChimp preset widgets? This shows the percentage of emails sent that were automatically returned by the recipient’s mail server. It is calculated by dividing the number of bounced emails by the total sent, and multiplying the result by 100. This shows the total number of emails sent. This shows the total number of fans your company has. This shows how many bounces occurred due to an invalid email address, nonexistent domain name, or unknown recipient. This shows the total number of in-email links clicked. This shows the total number of times your email was opened by recipients. This shows the unique open rate, which is calculated by dividing the total number of unique opens by the total number of emails sent, and multiplying the result by 100. This shows the total number of recipients who clicked on an in-email element. This dimension allows you to isolate your data based on mailing list. This dimension allows you to isolate your data based on recipients’ region. Want to see all our MailChimp metrics, segments & dimensions? How do I create a dashboard using the MailChimp API?